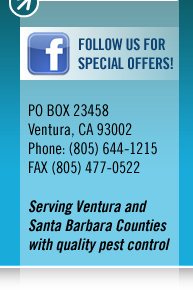 Pest Control from Shoreline Pest Control in Ventura and Santa Barbara counties. Get rid of rodents, unwanted birds and pests. We offer total pest control for you home, investment or business. Ants, spiders, birds, mice, rodents, insects and other pests are everyday problems that Shoreline Pest Control solves in a responsive, professional manner. We offer tailored solutions for both the interior and exterior of your home or business. With over 10 years of experience in pest control within Ventura & Santa Barbara Counties, we have developed a system of service that has proven to be effective, rarely requiring a return visit. We take great pride in the ability to solve your problem the first time. We are not your ordinary pest control company. We take great care to give you the personal service you deserve and outperform your expectations. Bed bugs have recently returned to residential and hospitality settings and are unlikely to be going anywhere soon. No longer a sign of economic status or sanitation concerns, bed bugs invade any and all residences and businesses. Once almost eradicated from the United States, bed bugs are back with a vengeance. The recent spike in populations across the country is due to bed bugs becoming resistant to many synthetic pyrethroid insecticides. These insecticides have been used exclusively by pest control companies to control bed bugs for many years, rendering their treatments ineffective. Shoreline Pest Control isn't your average pest control company. We have researched and tested some of the newest products for bed bugs, allowing us to custom design a Healthy Home Bed Bug Program that controls even the most resistant bed bugs from single-family homes and apartments to townhouses and condominiums. Managing bed bug infestations quickly will help us to help you. At the first sign of a bed bug infestation, we will inspect your entire home free of charge. Once properly identified, treatment can begin as soon as that same day. You will be educated by our trained experts on the biology and behavior of bed bugs, as well as the important role you will play during our treatment. Should I treat for them right now? Bed bugs cause a great deal of physical and emotional distress to almost any resident. They cause red, itchy welts from their nighttime feeding and are a general nuisance. If left untreated, bed bug populations will grow exponentially as each day passes, making them more difficult to manage. Shoreline Pest Control uses an integrated approach that includes the newest products that are proven to manage bed bugs, as well as steam treatments, which kill all bed bug life stages, in areas where our products cannot be applied. for your free, in-depth bed bug inspection today. We perform a thorough inspection of your home and pinpoint every possible rodent entry point that rodents will try to infiltrate your home. It only takes an opening the size of a rodent's nose for them to begin making themselves at home in your house. We are detailed in preventing and adding all necessary barriers to keep mice and rodents free from your home. Different types of birds from pigeons, sparrows, sea gulls and crows require specific control solutions. After your property has been inspected we will block the access points to your home. We keep birds off and out of you home or business from nesting or creating a nuisance. Birds settled too closely with people are not only a nuisance, but can transmit disease, contaminate food and damage structures. Bird nests can clog vents and attics as well as damage equipment of the surrounding ledges, ground, signs, niches and rooftops with their droppings. Bird droppings can carry diseases such as chamydiosis, salmonellosis and avian flu. Come see how we can best serve your pest control needs.